Like any angry god, El Pulpo Mecanico requires not just your fealty and your adoration, but also a small portion of any money you might happen to have lying around. Duane Flatmo does what he can, but the man is only a humble servant who has taken a vow of poverty (though not chastity) in service of his chosen deity. If you’d like to avoid the searing flames of a cephalopodic Hell on Earth and win the otherworldly favor of a powerful, up-and-coming idol, you could do worse than to tithe some pretty polly to His Pulpitude. Click, brother! Click, sister! GIVE UNTIL IT BURNS. Then the policemen of the Mayor took El Pulpo Mecanico into the common garage, and gathered unto It the whole band of mechanics. And they stripped It, and put on It a scarlet tarpaulin. And as they led It away, they laid hold upon one Flatmo, an Humboldtian, coming out of the country, and on him they laid the fuel bill, that he might bear it after El Pulpo Mecanico. And there followed It a great company of people and women, which also bewailed and lamented It. (Luke 23:26-27). Duane Flatmo just sent me this sneak peek of El Pulpo’s new front end! 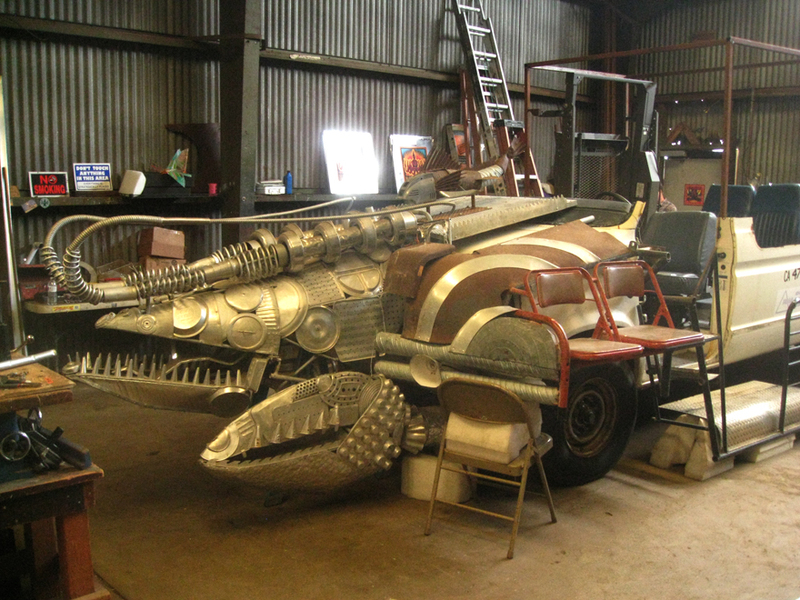 El Pulpo Mecanico, the steampunk art car in the form of an enormous cephalopod that first wowed us all at Burning Man 2011, is reportedly headed for the scrap heap. Pulp the Magnificent made what is scheduled to be Its final appearance at the 5th annual Sunday Streets in San Francisco earlier this month, instilling shock and awe into a large crowd of puny, flammable, cowering, non-metallic human supplicants gathered along a 3.3-mile stretch of the Embarcadero to worship the Eight-Armed One’s breathtaking puissance and beg It to continue to have mercy on most of the human race. 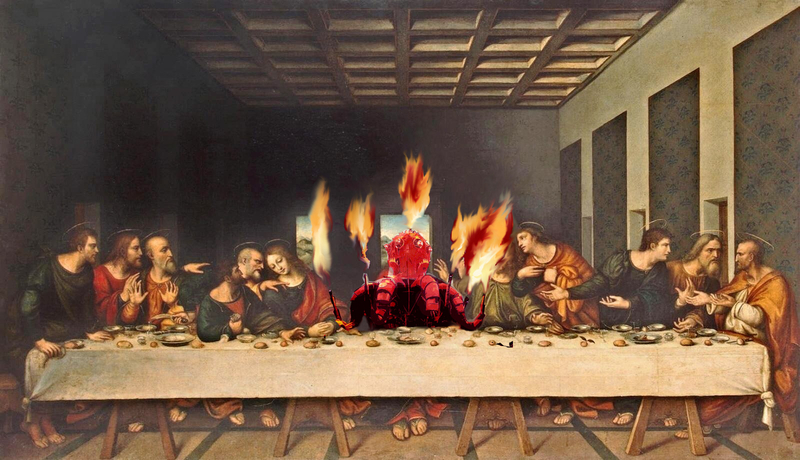 Jerry Kunkel, who claims to have plumbed El Pulpo Mecanico’s flame effects in spite of Its obvious godhead that transcends all human notions of time and space, says the crew that supposedly built the Divine One will be breaking it down for parts next week. Kunkel, veteran pedal-powered artist/designer Duane Flatmo, and wiring wizard Steve Gellman have stated many times that they built our many-limbed Lord from trash cans and junk metal obtained from Bonnie Connor’s Arcata Scrap & Salvage. This, of course, is heresy, and if he wasn’t one of the Four Apostles, Jerry Kunkel would certainly be consigned to a scrap heap himself in the afterlife, when El Pulpo Mecanico will remake the world and sit in judgment of us all. In 2011, your faithful correspondent was the first non-crew member to get a ride on El Pulpo Mecanico’s rumble seat, and as my hair singed and my scalp bubbled, the smile on my face only grew wider. 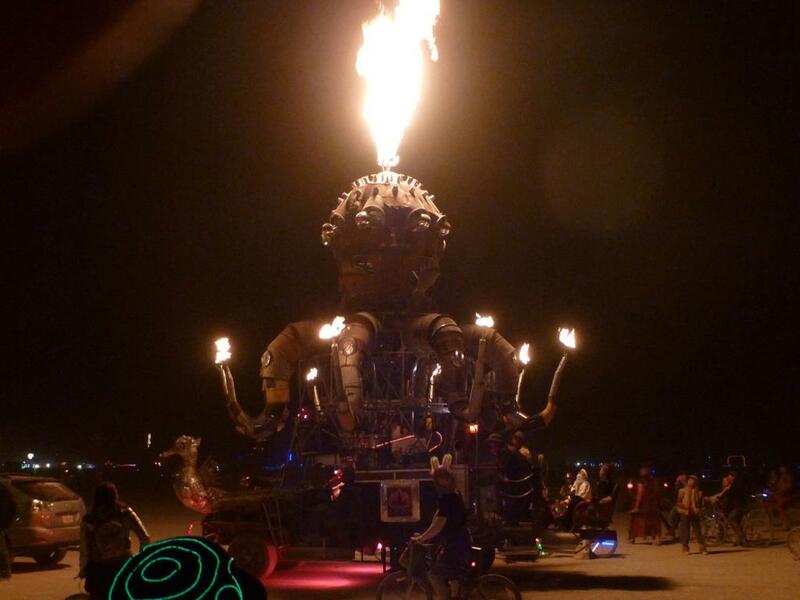 I could feel that while the iron-tentacled King of Kings that bore me across the playa would not hesitate to destroy me in an instant should I think a single bad thought, It also loved me. It changed my life. While it may be true that the forces of evil could, in theory, disassemble and destroy the corporeal form of the One True God, it’s also true that this would only free El Pulpo Mecanico from Its material ties to this planet. Strike El Pulpo down, and It will become more powerful than you can possibly imagine.